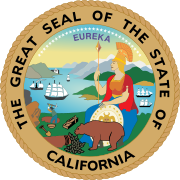 The 1994 California Attorney General election occurred on November 8, 1994. The primary elections took place on March 8, 1994. The Republican incumbent, Dan Lungren, easily defeated the Democratic nominee, Assemblyman Tom Umberg. Every candidate in this race was unopposed in the primary. Final results from the Secretary of State of California. ^ "CA Secretary of State - Statement of Votes - 1994 General Election" (PDF). Archived from the original (PDF) on 2008-07-30. Retrieved 2008-08-12. This page was last edited on 23 March 2019, at 00:08 (UTC).